Sue Martin and her service dog, Quan. Several investigations are underway into what prompted American Airlines to remove a blind Maine woman from a plane in Washington, D.C., and leave her in the terminal with her seeing eye dog. 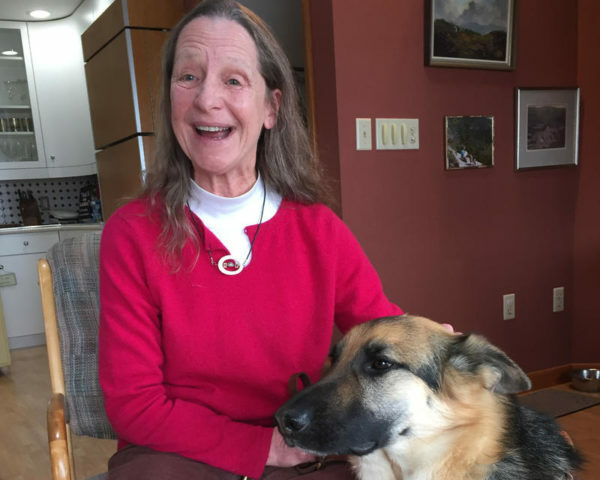 Sue Martin, 61, said she has yet to receive any explanation from American Airlines, but some guide dog advocacy groups suspect that the airline may have wrongly concluded that her service dog was only a pet. Near the living room fireplace of her Franklin home, Sue Martin introduced Quan, her guide dog, who was trained at The Seeing Eye Inc. in Morristown, N.J.
Martin said that while Quan provides a lot of love and companionship, he’s really on the job around the clock, serving as her eyes in and out of the house. On March 1, Martin and her husband flew from Bangor with Quan, and on the first leg of their trip, landed at Reagan National Airport in Washington, D.C. But Martin said as they attempted to board for the second leg, they had trouble finding a seating area large enough to allow Quan to lay down. Martin wound up falling, hurting her hip. She said when she asked the flight attendant to be assigned to a different seat, the attendant refused. She said she then asked whether she could purchase a first-class ticket, where there would be more floor room, but was again denied. The attendant, Martin said, explained that dogs could not fly in first class. Then a passenger in first class offered Martin his seat, and she accepted, much to the chagrin of an American Airlines supervisor, who Martin said directed her off the plane. Once off the plane, Martin said she asked him why she, her husband and Quan had been removed. “He said the crew has decided that your presence on the plane is not safe and you have to leave, and I just stared at him, and he said American Airlines knows all about emotional support animals, at which point I interrupted him and said, ‘Why are we talking about emotional support animals?’” she said. The couple took an $80 cab ride to a different airport and returned home on a United Airlines flight. Martin said she has yet to receive any explanation from American Airlines about the incident. The company issued a written statement to Maine Public Radio saying that it had apologized to Martin for her American Airlines experience and that it was investigating her allegations. The airline also said that service animals are welcomed on all flights. But some advocacy groups for the visually impaired and the service animal industry say the type of harassment alleged by Martin is becoming increasingly common as airlines cope with passengers who are trying to pass their pets off as service or emotional support animals. Jenine Stanley of the New York-based Guide Dog Foundation for the Blind said Martin’s case raises a lot of questions. “They considered her dog to be an emotional support dog when it wasn’t, they did not honor her request to change her seating as the rule allows — there was just a series of mistakes that happened here and I think maybe it’s a culture within American Airlines, I don’t know. I hope not,” she said. And Robert Mann of R.W. Mann & Co. in Port Washington, N.Y., which provides technical analysis on the airline industry, said that based on Martin’s version of events, there must have been some confusion among the crew if they didn’t recognize Quan as a legitimate service dog. “We even have the situation of a fellow passenger in a higher class service with perhaps more room offering to give up their seat and accommodating a support animal, a seeing eye dog in this case, which shows a lot of grace in my opinion and it certainly should have been considered by the crew,” he said. Martin’s complaint against American Airlines has been accepted by the U.S. Department of Transportation, and its investigation is just getting underway. In the meantime, Martin said she’d like the airline to reimburse her for the $80 cab fare. This story appears through a partnership with Maine Public.